Every year, the Montreal Alouettes organization visits hospitalized children and their families at the CHU Sainte-Justine university hospital center, the Montreal Children’s Hospital and the Montreal Shriners Hospital for Children. The players, members of the coaching staff, cheerleaders and team mascot Touché! meet over 200 children offering encouragement and support while they fight for their lives. The Alouettes bring gifts to the kids, take pictures with them, as well as sign autographs. Playing an integral role in the community is a priority for the Montreal Alouettes organization. The players also participate in the Alouettes “Together at School” program, which aims to help students succeed not only in the classroom but also in life. The team also has several initiatives in place to support amateur football in Quebec. 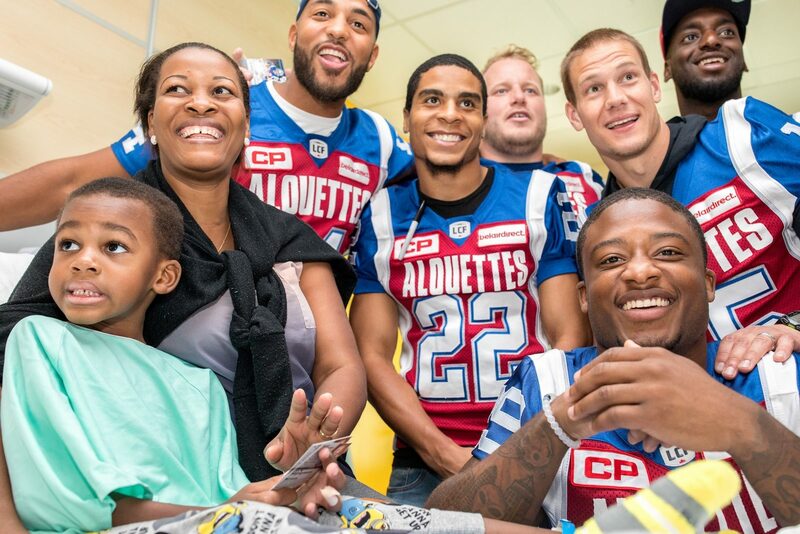 The Alouettes paid a visit to the children's hospitals of Montreal.